Today’s Gospel reading (Mark 9:17-31) takes place after the transfiguration on the mountain. Jesus and three disciples come down from the mountain only to find a scene of chaos and recriminations. The disciples who had stayed behind were not able to heal the boy with the “dumb and deaf spirit” – and there’s plenty of blame going around. I see here a parallel with Exodus 32. When Moses came down from the mountain with the Ten Commandments, he found a chaotic scene of idol worship – the golden calf. 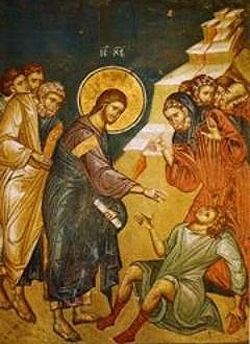 Here Jesus comes down from the mountain and finds a scene of doubt and blame. The real subjects of the miracle story are not the boy and his father, but the disciples! In the previous chapter, Peter wanted to hear nothing about Jesus going to his death, and Jesus struck back by calling him Satan! Coming down from the mountain in this chapter, they still don’t understand. And after the miracle, Jesus tells them again that he would be killed – but their ears and minds are still closed. The boy might have a “deaf and dumb” spirit; but the apostles are deaf and dumb to what Jesus is telling them. The father’s cry, “Help my unbelief” should also be the cry of the disciples. The spirit that possesses this boy is a metaphor for the forces and powers that control our minds and hearts “since childhood”. So, prayer and fasting are needed to overcome our inability to see that change and transformation are possible. Prayer requires self-knowledge, and self-knowledge can only come through fasting from all the illusions and attachments that paralyze us. Honesty is required at every step. There’s good psychology here. You can actually see the origins of the 12-step program right here. in this miracle story. You can only begin the healing process by accepting your powerlessness, and so you cry out with the father, Help my unbelief! Prayer and fasting – without them the search for healing becomes an endless cycle of frustration and anger, just as we see in today’s miracle. You become cynical, resigned to failure, thus deepening your paralysis and the harm in your life. What is that you feel powerless about? You can’t lose those 30 pounds. You’re like the father and the apostles. You can’t stop smoking. You’re like the father and the apostles. You don’t think you’ll ever amount to anything. You’re like the father and the apostles. You don’t think you can ever be the husband or the wife your spouse deserves. You’re like the father and the apostles. You don’t think you will ever have strong faith. You’re like the father and the apostles. You don’t think you can ever forgive your brother. You’re like the father and the apostles. And on it goes. A few days ago, Father Tom Hopko, one of my professors at seminary, fell asleep in the Lord. In honor of his memory, I share with you some bits of wisdom that he put together some time ago. Categories: Sermons | Tags: Father Tom Hopko | Permalink.